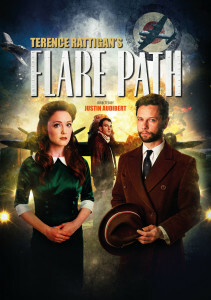 The producers of the forthcoming UK tour of Terence Rattigan’s FLARE PATH, directed by Justin Audibert, are delighted to announce the full cast, headed by the previously announced Leon Ockenden as Peter Kyle, Olivia Hallinan as Patricia Graham and Philip Franks as Squadron Leader Swanson. They will be joined by Adam Best as Flying Officer Count Skriczevinsky, James Cooney as Percy, Simon Darwen as Sergeant Miller (Dusty), Stephanie Jacob as Mrs Oakes, Shvorne Marks as Mrs Miller (Maudie), Siobhan O’Kelly as Countess Skriczevinsky (Doris), William Reay as Corporal Jones (Wiggy), Holly Smith as Maid and Alastair Whatley as Flight Lieutenant Graham (Teddy). As previously announced, the FLARE PATH tour will open on 18 August at Devonshire Park Theatre in Eastbourne (national press night, 2 September at Richmond Theatre). FLARE PATH will then tour to Richmond, Bath, Malvern, Exeter, Cambridge, Salisbury, Winchester, Ipswich, Coventry, Liverpool, Southend and Guildford.